As the title indicates, in the last two posts (Part 1 and Part 2 – and also be sure and check the comments from others) I’ve described the conundrum of organizing agile teams at scale, and said I’d provide some additional input from others along with some recommendations. Should the Agile Enterprise Lean to the Feature Team Approach? 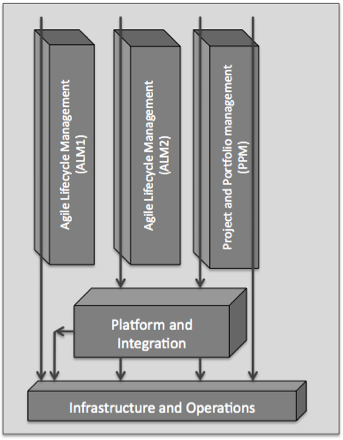 Given the advantages and disadvantages to each approach – essentially the balance of immediate-value-delivery vs. architectural focus and potential for reuse, the agile enterprise clearly leans towards the feature team approach, as there can be no question on the immediate value delivery velocity benefits and the focus of the teams. However, as we’ll see below, the answer is not that simple, and it’s likely that a more balanced approach may be required. ” Our first really important decision when thinking about how to scale agile is determining if the feature team approach will work or if we should consider a component team model. Feature teams are THE starting place for agile organizations. They are loosely coupled and highly cohesive and their inherent independence from the rest of the organization makes product development significantly faster and easier to forecast. That said… many organizations are dealing with issues that make the feature team approach difficult to implement at scale. These companies are developing products that are actually systems of systems. Integrating disparate systems… disparate technologies… disparate build environments… disparate locations… disparate cultures… and disparate organizational politics into a single integrated feature team is not always advisable for even a moderately sized development shop. For these organizations… the component team model represents a viable scaling alternative. Even in light of this advice, we must also recognize that features and components are both abstractions and the line is not so clear. One person’s feature may be another’s component. For example, TradeStation Securities builds an on-line trading system where “charting market data” is a key capability for the trader. A few collocated agile teams work together on the charting function. They are some of the world’s foremost experts in charting real time data of this type. On the surface, that looks like an excellent example of a feature team, as charting certainly is a major feature of the system. However, when new online trading capabilities are developed, such as “trading foreign exchange currencies (Forex),” new chart functionality must be added. However, driving this new chart functionality are major components such as streaming data, account management and interfaces with Forex exchanges. Is the new feature value stream described as “trading Forex all the way through the specialty chart function?” If so, that would make an obvious vertical feature stream and the teams might reorganize by taking some members of each component team and create a new vertical feature team for Forex trading. Or, is the feature “trading of Forex” plus “charting Forex”, in which case the charting team is already organized appropriately? Is the charting capability a feature set or a component? Both? Does it matter what you call it? “When we first interviewed Scrum coaches their view of Agile was solely focused on feature teams, this threatened to kill the initiative. Online trading requires a great depth of expertise and industry knowledge at many different levels. We could not reasonably form feature teams that included members from every component area. For one we’d have to increase our staff, and secondly the feature teams would be too large if they covered every facet of the trading process end to end. Therefore, for our transition to Agile we organized around component teams and through maturity we are now in special cases putting together feature teams where it makes sense. This works for us because feature teams are excellent at driving an initiative through completion. Figure 1: Five-team agile organization with various feature paths noted. Based on all this input and well-articulated arguments from both sides of the feature teams vs. component teams debate, what is my recommendation? Interestingly enough, at real scale (think 30-40-50 teams), features are such spanning items, that this whole argument can become almost silly, and those cases, a broader “program based” (groups of teams collaborating) organization model (not unlike the charting teams feature/component pod above) must be considered. But in the more typical, modest size enterprise or business unit (5-10 teams), my recommendation is to apply feature teams wherever practical, but to optimize neither for features nor components per se, but to optimize around collocation. Pick feature teams if they are already collocated. Pick component teams if they are already collocated. The communication, team dynamics, continuous integration support, and velocity benefits of collocation are likely to far exceed the benefits of the perfect theoretical organization, especially when the benefits of one approach vs. the other are not always so clear, as the various opinions indicate. As your agile organization matures, you’ll be so competitive that you’ll have lots of opportunity to inspect and adapt your model and evolve your organization in a way that makes sense to you. But in the meantime, maybe nobody will have to move!